At the moment, there’s only one approved, legal way to get to the orbiting International Space Station as an American astronaut: in a Soyuz spacecraft. Maybe you could pay the Chinese for a seat on a Shenzou, but that’s a long shot. At the moment, it’s Soyuz or nothing, and that agreement ends in November 2019. NASA, though, has a plan: two new crew spacecraft from private companies, and they’ve just announced the first astronauts to fly in them, and the first planned mission dates. While these are very welcome announcements, they’re not happening as quickly as many would like. The two new crew capsules, Crew Dragon from SpaceX and Boeing’s CST-100 Starliner, are both set for uncrewed test flights in late 2018 (SpaceX is set for November 2018, Boeing is set for later in 2018/early 2019) and crewed tests in April 2019 for the Crew Dragon and mid-2019 for the Starliner. By the time these test flights are performed and both craft are certified, it will be early 2020, which could leave a gap in time when NASA will have no means to send astronauts to the ISS. Still, this gap was largely expected, and, if all goes well, it really shouldn’t be all that long. I mean, we hope. This is still literal rocket science, and things do go wrong. The program both SpaceX and Boeing are operating under is NASA’s Commercial Crew Program, which was developed to privatize the now (comparatively) mundane part of space travel, the taxi service from the Earth to the orbiting ISS, which would leave NASA free to pursue the exploratory and research goals that are at the agency’s core. 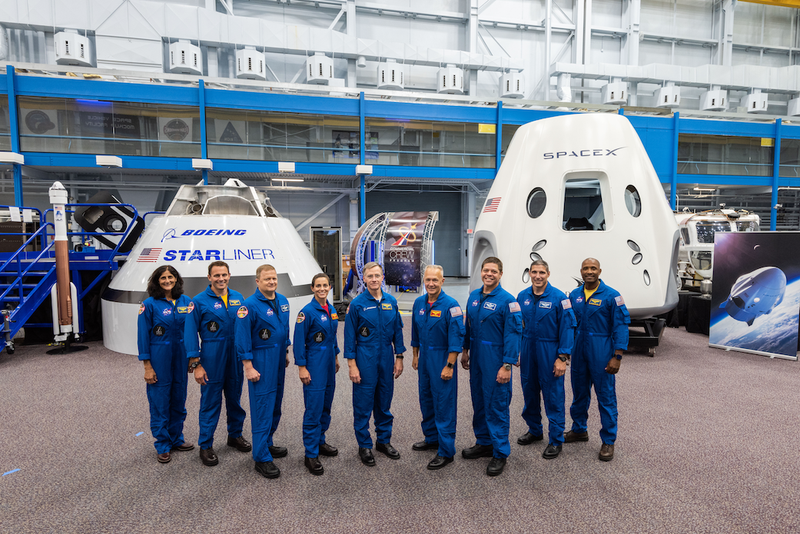 Nine astronauts have been selected to take part in the first crewed test flights of the new capsules: Sunita Williams, Josh Cassada, Eric Boe, Nicole Mann, Christopher Ferguson, Douglas Hurley, Robert Behnken, Michael Hopkins and Victor Glover. The Starliner’s test flight will be crewed by Eric Boe, Christopher Ferguson (both of whom have flown Space Shuttle missions), and Nicole Aunapu Mann, who will be making her first spaceflight. Ferguson is actually part of Boeing’s development program and is not technically a NASA astronaut. The Crew Dragon’s test flight will have Robert Behnken and Douglas Hurley aboard, both of whom are Space Shuttle veterans as well. The Starliner’s first actual mission will have Josh Cassada and Sunita Williams; it will be Cassada’s first spaceflight. The Crew Dragon’s first mission will have Victor Glover and Michael Hopkins aboard, with Glover making his first spaceflight. At this point it’s not announced but should be possible for both craft to carry up or bring back home ISS crew members, as both capsules should be capable of carrying four astronauts. I’ll be curious to see if they’ll utilize the spacecraft for actual crew transfer duties on their first missions. Both the crewed and uncrewed missions will use automated docking procedures, a first for NASA, but something that’s been part of Soviet and later Russian Soyuz crewed spacecraft and Progress cargo spacecraft for decades. The crewed missions will allow for interfacing and testing crew displays and controls, and have opportunities for some manual control of the spacecraft. The uncrewed spacecraft are currently being prepared for their missions, and their respective launch vehicles, a Falcon 9 for the SpaceX craft and an Atlas V for Boeing, are in the process of being built and prepared. This is a big deal. NASA hasn’t had their own way to get astronauts into space since the shuttles retired in 2011, and opening up orbital-ferrying trips to private companies should really help free NASA to focus on developing the Orion spacecraft, which is designed to be a true deep-space exploration craft. Hopefully, this will be the start of something big.